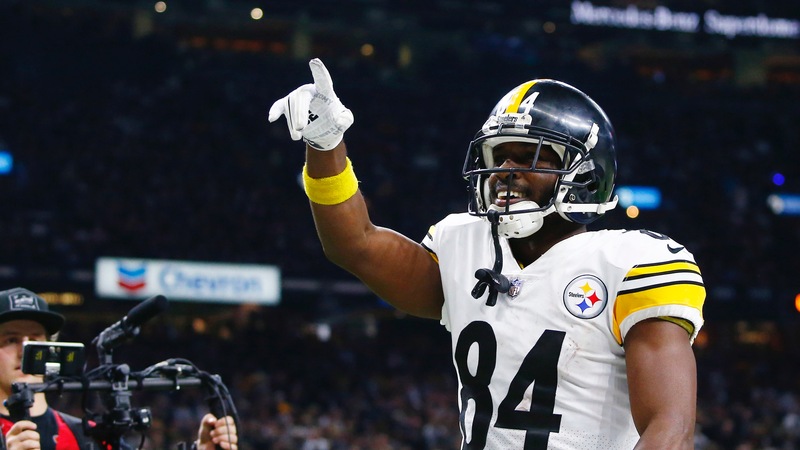 Pittsburgh receiver Antonio Brown may be on the move. Three teams in the NFC North make sense. The biggest non-Super Bowl story in the NFL is the ongoing Antonio Brown [saga](http://www.nfl.com/videos/good-morning-football/0ap3000001013900/Rapoport-It-is-A-B-s-preferred-option-to-have-a-fresh-start) in Pittsburgh, and whether the Steelers trade Brown will continue to be a major storyline in the offseason. There are [odds](https://www.azcentral.com/story/sports/nfl/cardinals/2019/01/14/antonio-brown-trade-destinations-arizona-cardinals-rumors/2570963002/), of course, for where the enigmatic superstar wide receiver will play in 2019 -- that [started way back in September](https://www.betchicago.com/antonio-brown-trade-odds) before things go too crazy. Meanwhile, Brown has been [dropping hints](https://www.nbcsports.com/bayarea/49ers/antonio-brown-asked-terrell-owens-about-49ers-bay-area-recent-chat) about where he wants to next play. No NFC North team is listed among the latest odds, per Bookmaker.eu. They are all part of FIELD at +302. But there are reasons why Brown heading to the division makes sense. Let’s take a look... __MORE:__ [Sharp bettors moving on several SB props](https://www.betchicago.com/super-bowl-53-prop-bets-las-vegas-sharp-bettors-rams-patriots) | [Why to take the OVER in the Super Bowl](https://www.betchicago.com/williamson-over-super-bowl-53) ## Potential Antonio Brown trade to NFC North __Chicago:__ This would be a power move by Chicago general manager Ryan Pace. Acquiring Brown less than six months after trading for Khalil Mack would be another master stroke. These are two players on track for the Hall of Fame. However, because of the Mack deal, it would be difficult for the Bears to acquire Brown. The Bears don’t have a first-round pick the next two years, and because so many teams are interested in Brown, it wouldn’t be shocking if the Steelers commanded a package including a first-round pick for him. Plus, the Bears are projected to have less than $15 million in salary-cap room for next season ([check here](https://www.spotrac.com/nfl/cap/2019/)). If the Bears can somehow get beyond the trade compensation and salary hurdles, landing Brown would be a tremendous step for a team that won the division without him this season. He would aid quarterback Mitchell Trubisky’s development and help make the Bears one of the most balanced rosters in the NFL. __Detroit:__ Matthew Stafford needs a lifeline. The Lions need a dynamic skill-position player. Brown would be the Lions’ best weapon since Calvin Johnson retired after the 2015 season. Yes, Kenny Golladay is a nice player (he had 70 catches for 1,063 yards last season), but Brown would be Stafford’s clear No. 1. It would also create excitement in Detroit, since Brown also played at Central Michigan in college. The only issue could be whether Brown would mesh with Lions’ coach Matt Patricia, who [showed last season](https://profootballtalk.nbcsports.com/2018/12/26/matt-patricia-on-importance-of-punctuality-it-depends/) he can be a bit offbeat. __Green Bay:__ It’s time for the Packers to get bold. They have won just 13 games the last two seasons combined. They need a spark. They have the means to make a Brown deal happen. Thanks to the Marcus Davenport [trade](https://www.businessinsider.com/saints-draft-marcus-davenport-trade-packers-2018-4) last year, the Packers have two first-round picks -- their own at No. 12 and No. 30 from the Saints. They also have $33 million in salary-cap room. The Packers can fit Brown, and he is what they need. Former Titans O.C. Matt LaFleur was hired to be Packers [coach](https://packerswire.usatoday.com/2019/01/28/packers-wr-davante-adams-is-digging-matt-lafleurs-plan-on-offense/) to help guide Aaron Rodgers to a fruitful finishing stretch of his career. Nothing could kick start that like Brown, who has at least 101 catches and 1,284 receiving yards in each of his last six seasons. __Minnesota:__ The Vikings make the least sense of all of the NFC North teams. They have Adam Thielen and Stefon Diggs at receiver. Plus, after giving quarterback Kirk Cousins a three-year, $84 million deal last year, Minnesota has just over $1 million in projected cap room. __Game lobby__: [Check out our free-to-enter contests](https://betchicago.chalkline.com/).